The filmmakers would probably hate it to be labeled as “an educational film,” but it’s true and is the highest praise. They pulled out all the stops to help the public understand the enormity and permanence of Wall Street’s crimes of the past decade. Would you buy a used car from either of these two guys? Great movie. 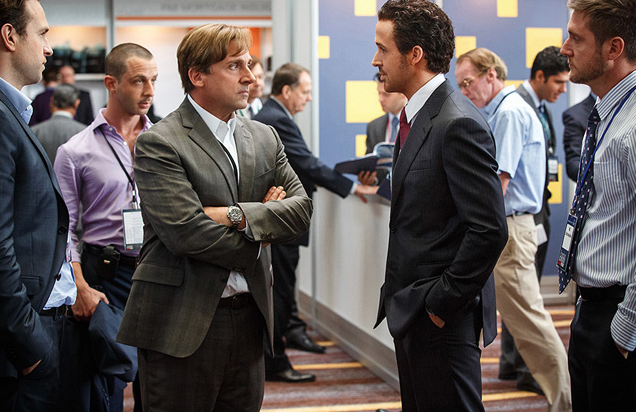 I went to an advance screening of the upcoming movie, “The Big Short,” (coming Dec. 11) based on the Michael Lewis book. It’s a fascinating and challenging movie — forcing you to run full speed with them as they do their best to explain all the tricks and cons at work on Wall Street in 2006, when the housing market bubble was getting ready to burst. It almost feels like a Discovery Channel show at times as they bring on all sorts of fun non sequitur cameos to explain the most complex concepts — like chef Anthony Bourdain at his chopping block using squid and halibut to explain derivatives (I think) or Margot Robbie in a bathtub explaining another concept while of course sitting in a tub full of bubbles. There’s also a lot of breaking the fourth wall — actors looking into camera to explain what’s going on — almost like having a “benshi” at times (the name of my old blog!). It’s very complex material, yet they don’t shy away from trying to get the audience to understand what happened. If you read the section in my new book about the fundamental divide between the more narrative form of archplot versus the more truthful form of miniplot, this is a movie that draws on all its muscle of star power and creativity to do an honest, as-accurate-as-possible miniplot job of conveying the truth. At one point, for one particular sequence, an actor talks into the camera and admits the real events didn’t happen like this for this bit, but that only strengthens the credibility of the rest of the film — that they would concede the few places where they did significant fabrication for dramatic purposes. It’s really an excellent movie. It won’t reach as large of an audience as if they had gone the more archplot route of synthesizing a fictitious character who could then experience all the stages of The Hero’s Journey. And that’s just more reason to admire the filmmakers. One more interesting twist — it’s directed by Adam McKay. Let’s see, what great hard hitting dramatic epics is he known for? Let’s start with “Anchorman: The Legend of Ron Burgundy,” and “Step Brothers.” That’s how much the producers pulled out all the stops to make this very difficult yet important material watchable for the masses — they knew they had the solid factual story from the book by Michael Lewis. To that they added an incredible team of actors topped off with a director who knows how to lighten things up. In the end, it’s a fairly sad and cynical story. There really aren’t any winners. Even the guys who became billionaires from their investment savvy ended up feeling at least a twinge of guilt that they did it off the savings, homes and retirements of all the less fortunate of America. And as most people know, only one of the culprits from Wall Street ever went to jail while the corrupt system underwent just about no reform. It’s a tragi-comedy of Shakespearean proportions.